While all seemed well in the East of Scotland League, with membership increasing year on year, trouble was brewing which came to a head at a stormy AGM in 1930. A group of Borders clubs, finding frequent trips to the capital expensive, attempted to force through a change that raised the gate guarantee from £2 10s to £3. The clubs complained that trips to play Edinburgh clubs saw them receive only the bare minimum guarantee, while city clubs travelling to the Borders received not only the guarantee, but half of all gate money in excess of £5, which could sometimes be as much as £10 or £15. For their part, the Edinburgh sides denied this and said that only Peebles Rovers and Berwick Rangers paid more than the £2 10s minimum. The Borders clubs managed to force the change through at the second attempt and the Edinburgh clubs were left in an impossible situation. The sum of £3 at the time represented 120 admissions and few capital sides attracted that many spectators. As a result, Murrayfield Amateurs, Edinburgh City, Edinburgh University, Leith Amateurs, Civil Service Strollers and Cameron Highlanders resigned from the East of Scotland League to form the Edinburgh and District League, although both Leith and Murrayfield would return within five years as the new league floundered. Season 1933-34 saw an epic Scottish Qualifying Cup Qualifying Round tie with Gala Fairydean, which stretched to three dramatic matches watched by a total of 4,500 people. A special train ran supporters to Galashiels for the match, which ended in a 3-3 draw after Vale had been 3-1 down. The replay saw another specially laid on train come from Galashiels and with 10 minutes of the match remaining Gala were 2-0 in the lead, but in a grandstand finish Vale netted a last minute equaliser. This was before penalty shoot-outs decided games, so the game went to a second replay with Vale winning the toss for the right to host it. This time after 30 minutes Vale held a 4-1 lead, but Gala striker Sherlaw completed a hat trick in the second half for a nailbiting finish to the match, but Vale held out for a 4-3 win. In the Scottish Cup Vale were drawn against the Qualifying Cup winners Rosyth Dockyard Recreation at home and won 3-0. In the next round they were drawn again at home against Scottish Division One team St Johnstone, managed at the time by former Rangers player Tommy Muirhead. In front of a 2,000 strong crowd, the game was poised at 1-1 at half time, but in the second half the superior fitness of the League side saw them scoring two late goals to win 3-1. At the 1934 AGM, Secretary Mr Alex Crabbe intimated that he wished to give up the position, but was prepared to carry on for another year provided an assistant was found and proposed Mr Edward Sanderson should be made Assistant Secretary. This was accepted and at the 1935 AGM Mr. Crabbe – who had held the position of Secretary for 42 years – retired and was replaced by Mr. Sanderson. Season 1936-37 saw what proved to be the only trophy won by Vale during the decade, capturing the King Cup for the second time. In the First Round Vale returned from a difficult trip to Penicuik Athletic with a 1-0 win in the bag. Chirnside United were swept aside 5-1 in the Second Round, while in the Semi Final it took three games to separate Vale and Edinburgh City ‘A’. After a goalless game in the capital and a 1-1 stalemate at Victoria Park, the third game saw the Innerleithen side edge through to the final 2-1, where they defeated Jed Artisans 3-1 at Galashiels. In 1938 Vale travelled to Edinburgh for a Scottish Cup tie with St Bernards. After a fine performance at the Gymnasium Ground in Stockbridge, Vale unluckily lost 0-1 and St Bernards then went on a run to the semi-final, defeating Partick Thistle and Motherwell, before losing to the eventual winners East Fife. However St Bernards had been so impressed with the play of Vale left-back J Miller they signed him a few weeks after the tie. 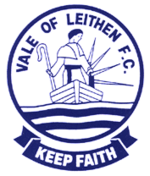 Other Vale players left to play League football; J Dodds and W Rathie joined Peebles Rovers before both signing for Hearts and Donald Murray who had originally come from Peebles Rovers, rejoined them before moving on to Ayr United and then St Bernards. Also in 1938 it became known that Miss Hay of The Ley had a shooting lodge that she wished to have removed. Vale expressed an interest through the joiner Bob Scott and the result was that Vale could have the building provided they removed it. The structure was transported to Victoria Park, where it was re-erected at the east end of the ground. Miss Hay was so pleased with the tidy state of the site where the lodge had stood, she sent a cheque for two guineas, which was quite a nice donation in those days! Although it is nice to report pleasant happenings, some not so pleasant things also happen and an astonishing incident in 1938 saw Vale captain Jock Watson handed a life ban by the SFA after a game at Berwick Rangers. During the match, the home side were awarded a penalty for an infringement which took place a couple of feet outside the penalty area. The referee, who had been well behind play at the time, ignored Watson’s appeals against the decision, which had included pointing out the tell tale marks on the turf, whereupon the Vale captain pulled the official round and floored him with a left hook! An inevitable red card followed, but afterwards Watson apologised to the official, who said he understood that his actions had been a heat of the moment thing. However, it didn’t end there as Watson was charged with assault and fined £4 at Berwick. The SFA also dealt with the case and handed Jock, a centre-half who had previously played with Ayr United and been a great servant to the Vale, a sine die suspension. The 1939-40 season had no sooner started when The Second World War broke out on the 3rd of September 1939. Once again organised football was curtailed and Vale players were called up. * Hawick United resigned from league after 8 matches and their record expunged. * Berwick Rangers deducted 1 point for fielding an ineligable player. * Berwick Rangers withdrew from the league in January 1937, but their record was included in final table. * Jedburgh Artisans closed down in December 1937, but their record was included in final table. Several other clubs closed down temporarily for the last two months of the season for financial reasons. NOTE: League closed down after outbreak of Second World War.